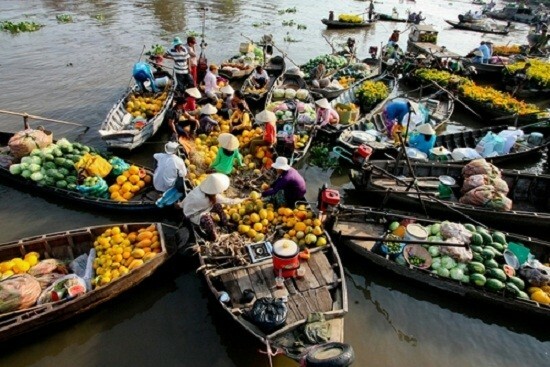 Early visit Cai Rang floating market, wandering around to see the make noodle, orchard garden and try your best on bamboo bridge. 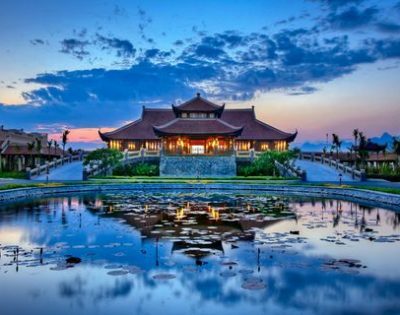 08.30am: take a rest at Mekong rest stop where you can see all of the landscapes of the Southern Vietnam in its garden and able to enjoy tasty cuisines in Mekong region. 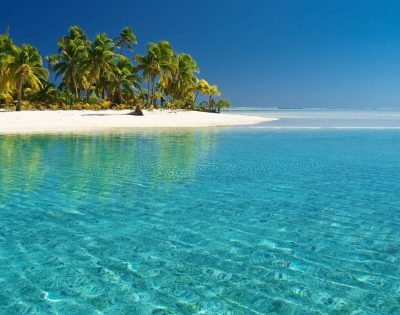 It is really an impressive place for tourists. 09.30am: arrive to Cai Be dock. 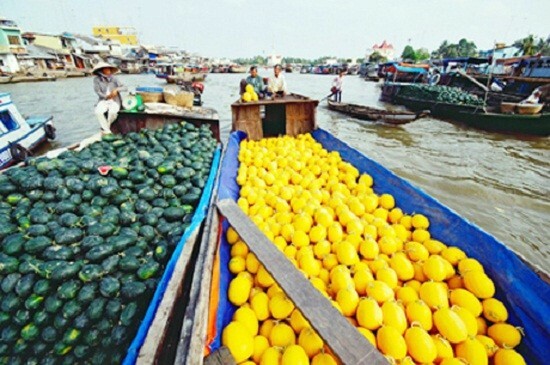 Cruising in the river to the busy Cai Be floating market where is placing many boats filling fully fruits and agricultural produces on. 12.00: our boat will take tourist to Tan Phong Island for having lunch. 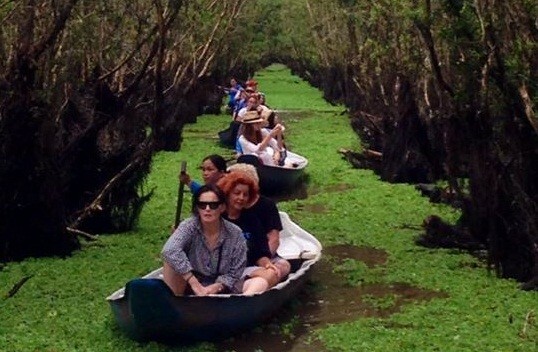 Then getting on hand – rowed sampan through the creeks to enjoy the natural beautiful landscapes and the peaceful life of the islanders. Listening and watching traditional folk music performance in an orchard garden. 15.00: cruising back to Cai Be dock and visit a land market. Having breakfast at the hotel. At 07.00am, driven to Sam Mountain a particular symbol of Chau Doc town to visit Xu Lady temple and Cave Pagoda. Then take a nice boat trip through the floating village to visit a fish farm to see how the Mekong Delta people raise fish in their floating houses. Visit the Cham minority with their traditional weaving village, followed by a local Islamic Mosque. Transfer to Tra Su cajuput forest, which is renowned for not only its almost-untouched natural beauty but also its sanctuary of flora and fauna. 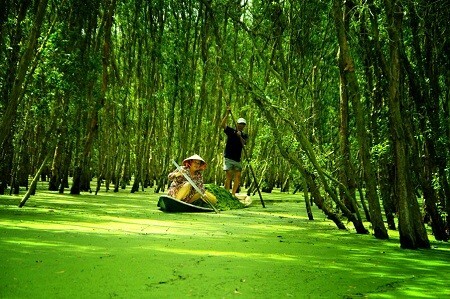 Take a boat trip into the forest, you will immediately feel like you are harmonizing with nature because of all of the impressive pictures of cajuputs, the fragrance of the flowers and the music-like noise of birds, insects and animals making people relaxed and comfortable. From the observation post, you can overlook the forest with an area of nearly 900 ha, home of many birds and animals, including some rare ones. After that, proceed to Can Tho city. En route, stopover at Long Xuyen to see crocodile farm. 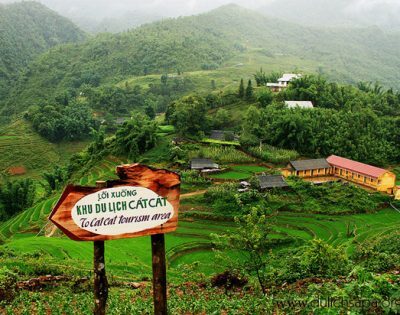 Continue your trip to Can Tho and visit Binh Thuy ancient house village before transfer to a village in Cai Rang district by motorized boat, you will meet a friendly local farmer’s house where you will stay the night at their house. 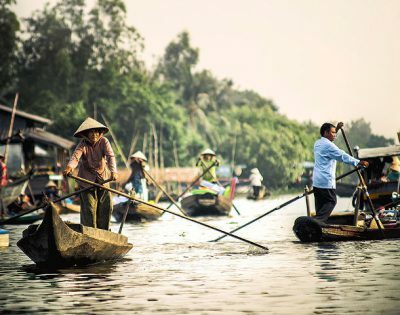 In the late afternoon, wandering or riding on bicycle around the village to see orchard garden or chatting with local people to experience the rural lifestyle of the Mekong Delta resident. Joining prepare cooking dinner with family and enjoy some of kind traditional local cuisines. Overnight at farmer’s house. After breakfast at the famer’s house. At 06.30am, boarding on a motorized boat to Cai Rang floating market. 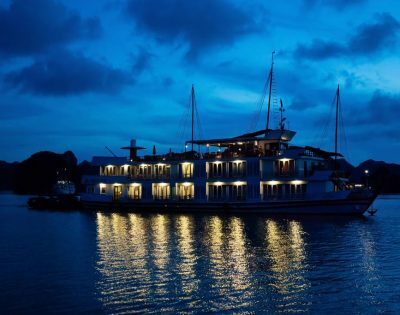 In the way, you can see many bustling activities along Can Tho riverbanks. 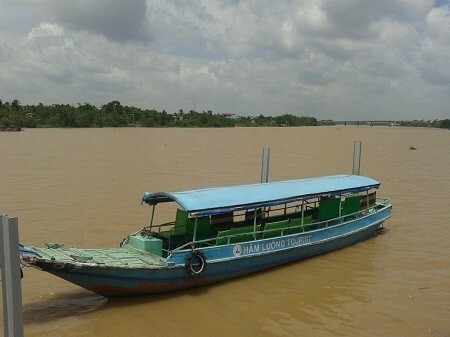 You have chance to know how local people go fishing and transport passengers as well as product by the waterway. The tourist will visit the local rice-nobble factory and learn about the traditional method for producing the rice-noble. 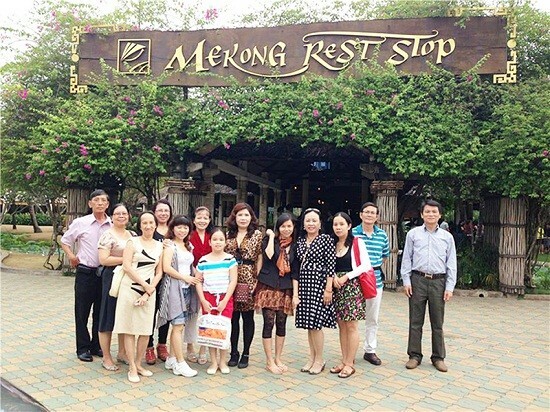 Visting Ba Cong garden where you can enjoy some special seasonal fruits. Cruising back to Ninh Kieu Wharf and return to Ho Chi Minh city. Arrive to the city and drop you off at your hotel around 16.00.